The five-day long march of 30,000 farmers from Nashik to Mumbai has touched a chord with urban India. Even though some said they were implementing the agenda of ‘urban Naxalites’, the pictures of poor tribals and farmers, men and women, old and young, walking in heat, many without shoes, will continue to haunt policy makers selling dreams of new India. So what was new this time? 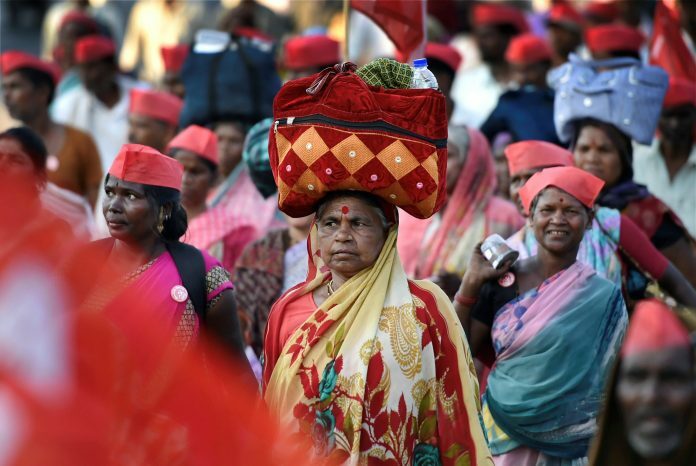 More than anything else, the orderliness of the long march rattled the financial capital of India and brought the focus to continuing distress of landless tribals and farmers. Among all the Indian states, Maharashtra is a better-performing one in several ways. Its agriculture is more diversified than most other states. It has performed well in horticulture and exports grapes worth Rs 1,200 crore. It has functioning marketing infrastructure and has done better than most other states in adopting water-saving technologies like micro irrigation. However, out of 137 lakh operational holdings, 78.6 per cent belonged to 107 lakh small and marginal farmers, who hold less than two hectares of land. The leaders of the protesting farmers would not be unaware of the fact that only 18 per cent of the cropped area in the state is irrigated. Sugarcane grown on just 4 per cent of gross cropped area in Maharashtra is almost entirely irrigated, and takes about 65 per cent of its irrigation water. Therefore, it is not surprising that production of sugarcane is likely to be 25 per cent higher this year while the production of kharif pulses and oilseeds declined by 46 per cent and 15 per cent respectively. It is clear that the rain-fed farmers experienced sharp decline in their income this year. The situation in rabi is no better, and it is expected that the production of cereals and oilseeds will decline by 39 per cent and 73 per cent respectively. So, we should expect the distress to only aggravate as we reach the summer months. Cotton is grown on 19 per cent of the cropped area but only 2.7 per cent area is under irrigation. To add to the misery of cotton farmers, a pink bollworm pest attack has affected large areas under cotton. Some reports suggest that about 35 lakh ha of cotton crop —about 84 per cent of area under cotton — has been affected by pink bollworm. In December 2017, the state government had announced a compensation of Rs 39,000 per ha to cotton growers affected by pink bollworm, but it seems not a single farmer has received the compensation. We still do not know how much area was covered under Pradhan Mantri Fasal Bima Yojna. If the insured cotton farmers can be paid their claims promptly, the crop insurance scheme will be considered successful. For this, the crop cutting experiments have to be conducted by the revenue department of state government and one hopes that long march will have persuaded the state machinery to conduct them with speed and accuracy. In the meantime, the government of India should make up its mind whether it wants Bt cotton to continue in India. With repeated interventions, it has ensured that Monsanto does not bring any new technology to combat pests, so it is now entirely up to ICAR and Indian companies to fill the void. It seems that a large number of farmers who took part in the long march were landless tribals, who according to the chief minister were not farmers. For decades, the tribals have been demanding allotment of up to four hectares of land that has been cultivated by them, but they do not have title documents. They are not eligible for bank credit, and must be borrowing from private money lenders at exorbitant rates. Ironically, the union ministry of environment and forests has proposed new rules that will enable the forest department officials to grow plantations on lands under cultivation of tribals, without even consulting them. The proposed rules will further alienate the tribals, and it will be tragic if, after a mass protest in the form of the long march, the central government goes ahead with the enactment of such rules. And finally, it is the poor implementation of the loan waiver which seems to have rattled the farmers. When the announcement to waive loans was made in June 2017, it was estimated that the waiver will amount to Rs 34,022 crore, and it will benefit about 70 lakh farmers. The banks have so far waived only Rs 13,882 crore to 35.7 lakh loan accounts. In the meantime, the farmers whose loans are yet to be written off would not have been found eligible for availing crop loans in kharif 2017 and rabi 2018. It is nobody’s case that problems of agriculture can be fixed by soil health cards, loan waivers, crop insurance or e-NAM etc. Farmers demand a sincere attempt to at least fulfil the promises made, and then build political consensus over the road ahead for making agriculture viable. Unlike metro rails, dams or bullet trains, demonstrating real progress in agriculture will require the government and the opposition, the Centre and the states working with a common purpose over long years. Compared to any other sector, it is surely more difficult to bring ‘achhe din’ to farmers. The author is retired secretary, agriculture, government of India, and is currently visiting senior fellow, ICRIER. A well researched article.Very typical of Siraj Hussian saheb,who always goes deep into the subject .I know,because I had the good fortune of working with Siraj sahib.I wonder how many of those who matter are aware of these problems in Indian Agriculture.I hope they get wiser after reading this article .Congratulations to the author for this indepth analysis.